It is hard to tell from the pics, but the wavy siding at the lower right side of the window looks like it may be delamination. This might be a picture anomaly or not. Up above the amber marker light, the flat dent so to speak could be a dent from something in the past. As long as the siding is not physically cracked which would allow water to get in, then this is a cosmetic problem. That does not look like classic delamination. We call the fiberglass siding that had separated from the substrate behind it, delamination. Delamination most times happens when water gets in behind the fiberglass from a leak and attacks the glue that holds the siding to the substrate. Odds are high Sunline used 1/8" luan or a corrugated product called Unicore as the substrate on the front panel as they had to bend it around the curves. 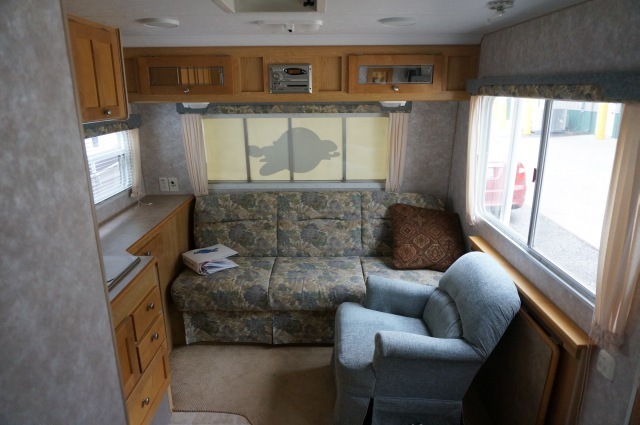 You may have already, but before buying a used camper, everyone should take a look at some of the rebuilding a camper after water damage threads here to put what you could be buying into perspective. Most (all?) examples of rebuilds here are Aluminum siding not the fiberglass option, but you will get an idea of what is involved. Along with the moisture meter (I haven't used one on a camper) get tactile with the area. Get a ladder, lightly push on the area and compare to adjacent, knock on it. Look inside below the area for signs of previous water. Use your nose too. I wouldn't trust anyone saying "not a big deal"... not that most people would try to be deceptive, they just don't know what a big deal small looking problems can be. We are hoping for the best for you! I've done similar in the past on impulse, so hope it works out for you! Flip is very needed for many and an easy job, I've done it. The camper life is pretty good. Lots of ways to do it! Thanks Tod, Im trying to find part number now to get it ordered. My house is right in front of a mountain, so coming off the road it my drive is pretty steep. I have a bad feeling Im going to have to get that done at by Buddys shop before I even get home. I might also see about ordering those little skate wheels for the very back of the frame just incase.. Thank you! I see these being very addictive! I waisted the whole morning research parts and campgrounds I would like to visit. That looks like delamination to me. Most times from water intrusion. Or I guess it’s possible that it’s from a manufacturing defect. Either way the first thing I’d do is inspect the roof and all seams/sealant on the whole camper. Hopefully yours won’t get any worse than it is as it’s not an easy fix. If you look at other campers going down the road you’ll see plenty with delamination. Way worse than yours. Thanks I got it home, and of corse now I see water in the marker light on top! Oh boy.. The light should be an easy one, mine all cracked and held water. 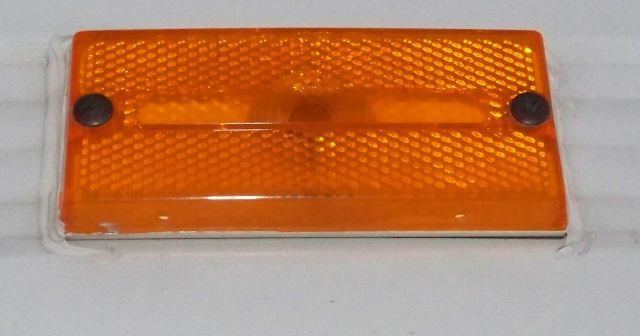 Check the size and shape, but several manufacturers make lights that were compatible with mine (if I remember right the original manufacturer doesn’t make them, but several others make them to the same spec, optronics and bargeman). The old bases fit into the new lenses perfectly (no wiring needed). I put LEDs in them and added a line of dicor across the top for extra protection and used one size larger stainless screws. 1. A roof seam leak. The 4 corners of the camper roof and the front and rear seam have been the most likely places on the roof followed by a gutter rail leak through the rusted screws. Then there is any other roof penetration is susceptible, vent hatch, tank vent, TV antenna etc. 2. A corner molding leak. These are the 4 corners of the camper side walls. The sealant called putty tape, shrinks over time, then it cracks and separates from the siding or the molding. The cracks and separations are is a leak path when the problem is advanced enough. Not all sealant failures on the corners are leakers, it needs to be blasted enough with water to get in. This can range from towing in the rain to water running off the roof when the camper is stored and beating into a corner molding. 3. 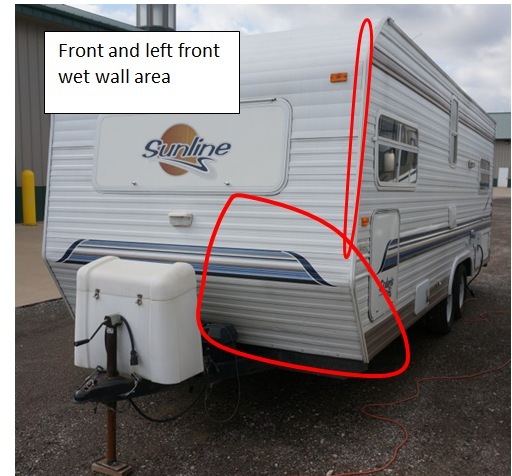 A sealing flange leak on an entry door, window, cargo hole door, a furnace, hot water heater, electrical cord door, literally any penetration into the sides of the camper walls. And there are lot of them. This is a putty tape sealant failure with the same issues as no 2. above. 4. This is sort of the catch all area... Something hit the camper and poked a hole in it, where ever it is. And there are other smaller areas too, like a torn Darco waterproof membrane under the camper, leaking toilet, leaking hot water heater etc. With the top 3 methods listed above, they can start as slow seeper leaks. Not a gusher. Let's take a roof front seam leak. This is the area where the roof rubber transitions to the front wall. There is a molding strip that is sealed with a thin amount of butyl sealing tape. The butyl is superior to putty tape but it is not applied very thick. On the outside edge of the butyl their is Dicor self leveling caulk. When the caulk is compromised and failed, then the butyl cannot always ward off a leak. Let's pick the right front corner of a roof seam leak to talk about how a water infection occurs. That corner area flexes the most on the roof due to towing down the road. The whole camper is flexing and the corner can flex the most. If a prior owner never knew about roof maintenance and how often it has to be done, the caulking breaks down due to UV sun rays and age. Left unprotected the caulk starts to crack. At first it is a hairline tiny crack. If the crack is found during a routine roof maintenance check, it gets cleaned and then fresh Dicor put over the top. It is now patched and does not leak. Left unchecked the crack grows bigger. The camper being stored outside in the winter outside is the worst. The crack fills with water, freezes and expands accelerating the crack. Come spring or late summer this might be a seeper leak. The seeper lets a small amount of water get in during every rain. Maybe at first only 8 oz of water seeped in on the first rain. The ceiling insulation soaks it up and the bud board roof material starts wicking it, gravity also takes over. Now after a few months of rain storms letting 8 oz of water in any water that is not absorbed into the budboard or the insulation starts heading "down". The easiest path most times on a roof corner leak, is to follow the corner studs down the wall to under the floor of the camper. The ceiling and the walls use vinyl wallpaper and a vinyl molding at the wall to ceiling joint to make it looks nice. Since the camper lives outside all the time, the wall paper being vinyl is a good thing. The moisture does not affect it. And water in the walls does not affect it in the early stages of a leak. 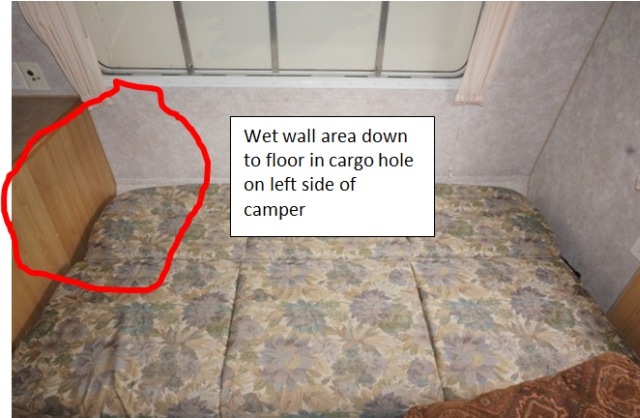 Point being: A water infection can be in the walls of the camper and you will never see or smell anything inside the camper. This may be ongoing for several years as a seeper leak. After enough years of seeping the wood rafter and luan plywood walls start to rot and then the leak at the roof can become larger as the molding to hold the roof seam on is all rotted and the screws no longer hold. Now the seeper is starting to become a gusher. After enough years left unchecked the 1/8" luan rots out and then you can see the leak inside as there is no glue left or wood to hold the vinyl wallpaper. OK don't freak out...we and you have no idea if you even have a leak yet! My long explanation was to show you how you see no leak inside but the wall can be wet in the wall cavity. On aluminum sided campers the aluminum hides a lot of what is behind it. Sometimes it will corrode from the inside out and sometimes screw heads rust from the inside out. Fibreglass siding like your does what we call can "delaminate". The water affected the glue holding the fiberglass to the substrate and a bubble in the fiberglass shows up. The good news is, once educated a little you know what to look for. Somehow the glue let go and a water infection is the most likely cause. Spending the $40 on a moisture meter like I linked you will tell you a lot. 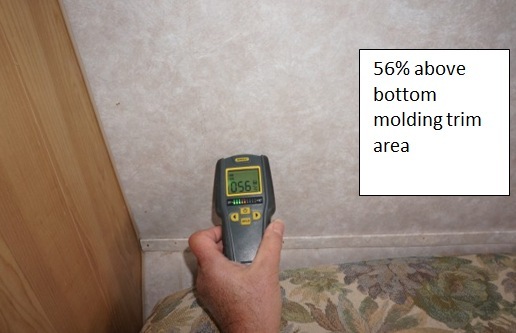 Since you have fiberglass walls, you can scan the camper from the inside wall board or the outside. Just make sure it is not excessively moist like a damp wet spring morning otherwise everything may come up wet. There are also some things that cause false blips on the meter, but water infection is not a blip. It is a large area. A screw or wire cable (metal) can cause the meter to blip high. But the meter is a great tool to help you figure out how large or not the problem is. 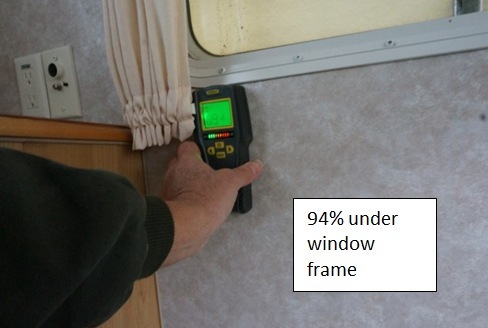 Once you scan the camper, then you have good evidence you have a problem or not. If your caulk is bad, then that will need to be addressed soon. By at least stopping a leak the problem is not getting any worse and you can be preventing a new one somewhere else. The other good news, everything on these Sunlines can be repaired. And by you if you have common wood tools and a little know how on how to use them. We can help with on how the camper is built and how to repair. Before we start talking about how to fix it, we and you need to know how big a problem you have or not. See these pics when I was inspecting a camper for a good friend. If you can repeat something like this, then you will know if you have a problem and we can see what you are up against. This happens to be a T-2363 and it has a corner molding leak and a front window leak. The roof on this camper had not yet leaked. A scan of the wall around the front window. A diagram to show how far the water has spread. One inside and out. Pictures really help in these cases. Even more pics of the bubbled areas helps. I picked up on the lower part of the window when you were talking about up at the amber light. Odds are high that may not be a mega leak, but is can be too. And yes as Tod said, run a bead of Dicor non leveling, non sag caulk over the top and 2 sides. I did the 2 sides too. And I drilled 2 small holes in the bottom of the lense so when the new one or old one fill with water it can get out and not migrate into the camper.